I have a mother who travels light on clothes and heavy on food. Her suitcase might contain a set of practical yet spiffy dress pants, a couple of chic skirts and blouses, maybe a sweater when she arrives in Germany from Greece where we sometimes meet. But her suitcase will not be empty by a long stretch. Fancy clothes be damned, out tumble several packages of feta cheese in brine, a few pounds of her favorite Greek hard cheeses, enough shiny black Kalamata olives to last through the next ice age, dried prunes and dried figs, perhaps crisp walnuts from the new harvest, and maybe some tangy trachana pasta. If she could, she would add a crate of fresh Greek tomatoes which are her bread and butter. Last but not least, there always will be a few packages of dried beans. Yes, plain dried beans. As if, in all of Germany, you couldn’t get some humble ole beans to make a pot of soup with! Or so I used to think. Well, today I know better. My mom is frugal and loves her food. So much you know by now. But the first time I saw her arrive with dried beans in her suitcase, I was somewhat taken aback. I sure felt she had taken her frugality and culinary obsession one step too far. But I was soon taught a lesson for life—a lesson that spills the beans: there are dried beans and there are fresh dried beans. Her carefully selected legumes were creamy and soft, with a rich nourishing quality, similar to almond butter. They had an earthiness that made flavoring almost unnecessary. My mom prepared them accordingly. She simmered them with a laurel leaf and an onion, nothing more. And in the end the beans were presented blissfully unadorned: she put them with some of their cooking liquid in shallow soup bowls, with a drizzle of olive oil, a squeeze of lemon juice, salt and pepper. I can still taste them to this day. I had never quite understood why so many bean dishes I ate in Greece tasted so good. I always thought they were just prepared well. But no, they tasted out-of-this-world because the dried beans were fresh indeed. Fresh as from this year’s harvest, picked and dried just a few weeks ago, perhaps a couple of months ago. 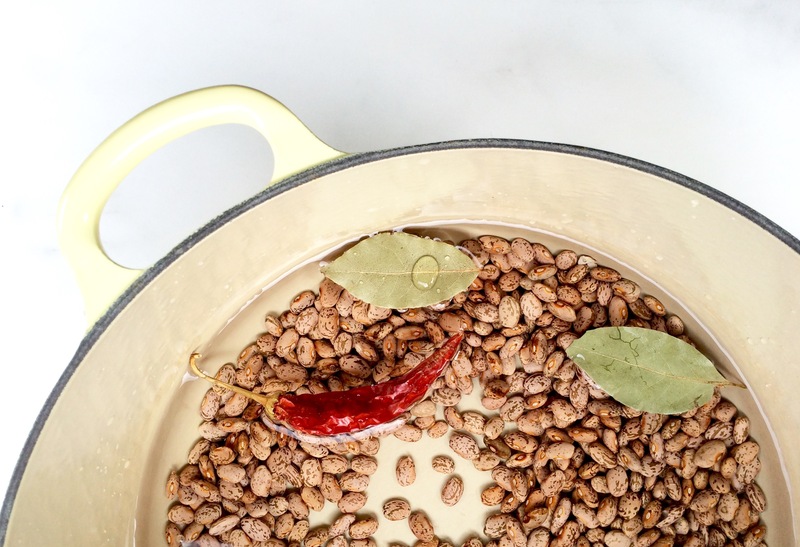 Thus, as strange as it may sound, these “fresh” dried beans are far superior to regular dried beans you might have in your cupboard since, like, forever. I’ve been there. Because just like whole grains beans will harden and become old over time, and thus less appealing to cook and eat. So mom was right, of course. And until the harvest date is printed on all packaged beans—and grains if I may add—no one knows how long they have lingered in a warehouses or on store shelves before you take them home into your kitchen. Today, we finally can get high-quality fresh dried beans here in the Northeast, at farmers markets, and fabulous heirloom beans online, for example at Anson Mills and Rancho Gordo. Long story short, I want to use this post to introduce a lovely unobtrusive small book, titled Beans & Field Peas. It is by my friend and colleague, Sandra Guiterrez, who is an expert in Latin cuisine. Sandra is also the author of Empanadas, the hand-held pies of Latin America, Latin American Street Food and The New Southern-Latino Table. And she has studied her beans and their history—from cowpeas and black-eyed peas, to creamer peas, and Lima beans. Her recipes are simple and sumptuous all the same. Just to give you an idea: Purple Hull and Benne Seed hummus, Lebanese Green Beans with Tomatoes, and Speckled Butter Bean Ceviche with Grilled Shrimp. And there are drunken beans. And they are amazing. While it took me a while to get to this blog post, apologies Sandra, the timing couldn’t be better as the UN has declared 2016 the year of the pulses, which includes nutritious beans, chickpeas, and lentils. 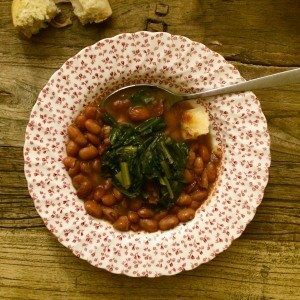 Plus, winter is finally here on the East coast, so slow-cooking a bean stew is just the ticket. If you want to explore beans, go get this book. And if you like Southern food, check out this post I wrote recently introducing a few more great new books. I had never cooked beans in beer so Sandra’s recipe for Drunken Beans piqued my curiosity. Incidentally, it seems that beer slows down the cooking of your beans a lot. So plan ahead. I ended up not eating them the same night because I didn’t read the recipe all too closely—I never follow my own advice!—and the beans needed 2 1/2 hours to soften. The delay turned out a blessing in disguise because, like all stews, this one tastes even better the next day. So be sure to plan ahead. The night I served the soup, I also sautéed some dandelion greens following the Go-To-Greens recipe in my Simply Ancient Grains. I topped each bowl with some of the greens, and that worked so well I surprised myself. The bitter greens turn sweet when cooked—they mingle with the sweet notes of the ham and onions, and the natural bitterness of beer that permeates this stew. If you are vegetarian, you can omit the ham. Just drizzle on a couple tablespoons of low-sodium soy sauce at the end for umami. I made one small change to Sandra’s splendid recipe. I drizzled on some olive oil—hey, I’m half Greek, don’t judge. Sandra writes: In Spanish, these pinto beans are known as frijoles borrachos because they’re cooked in beer. If you’ve never tried them before, you’ll be surprised by their subtly sweet and smoky flavor. This recipe is very common along the U.S. border with Mexico, and you’ll find variations on the theme all the way from New Mexico to Texas. I recommend that you use your favorite Mexican beer because you’ll be able to taste it throughout the dish. I like these beans on the soupy side, but if you prefer them a bit thicker, remove and mash some of the beans and return them to the pot. Serve them on their own, with flour tortillas, or as a side dish with grilled meats. Place the beans in a large bowl. Add enough water to cover the beans by at least 2 inches; soak them for at least 6 hours or overnight. Drain the beans and rinse them under cold water. Place the beans in an 8-quart pot; add the beer and enough water to cover the beans by 2 inches. Add the ham, onion, and garlic and bring the beans to a boil over medium-high heat; partially cover the pot with a lid, reduce the heat to low, and simmer the beans slowly until they’ve softened, about 2–2½ hours. Add more water if necessary (you should always have at least 1 inch of liquid above the beans); season with salt. If you wish them to be thicker, remove 1 cup of the cooked beans from the pot; mash them well with a fork and return them to the pot. Simmer for 5 additional minutes and serve. Great read and recipes about field peas or cow peas in this New York Times story by Kim Severson. And, another New York Times story on the new Marcella beans, as in the late Marcella Hazan. And, I love this Vegetarian Black Bean Chili with Ancho and Orange by TV chef Ellie Krieger. Yum! I can’t wait to try this. I’m living in the South this year and I’m loooooving field peas. I froze a bunch from this summer. Fresh purple hulls. So good. So much better than the stuff I’ve found in stores. How lovely to hear from you. Thank you for your note. I’m thrilled that you are inspired, and I agree with you field peas are amazing. Let me know what you think of Sandra’s recipe for Drunken Beans. Happy cooking!